An introduction to the nautical history of the North Atlantic - a seaman's view of the Atlantic crossing. For centuries the Atlantic hemmed Europe behind its storms and mysterious breadth. This was the Ocean Sea that extended to nowhere, or to the end of the world. Although there were legends of crossings by Celtic saints and Norse ocean farers, it took the vision of an Italian and the finance of a Spanish queen to shatter the shackles of superstition. Columbus was the catalyst who opened the door to the modern world. 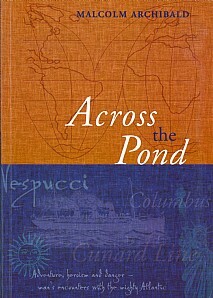 Across the Pond tells of the changing use of this ocean, from a barrier to a route to riches and a highway for trade. There are episodes of exploration and exploitation, there are fighting ships and fisheries, treasure and timber and always the dangers of the sea. There also slipped the slavers with their cargo of shame. This is an ocean that bred some of the world's hardiest mariners, famous men such as Cabot and Hudson and Vespucci but also the nameless thousands who manned the ships, the hard-used mariners from the Chesapeake, the Solway and Seville. Here was bred the down east Yankee, the Nova Scotian bluenose and the Scouser from Liverpool. Crossing the Pond tells some of their story.